The move “may have been exactly what two of Trump’s biggest donors, Sheldon Adelson and Bernard Marcus, and what one of his biggest inaugural supporters, Paul Singer, paid for when they threw their financial weight behind Trump. 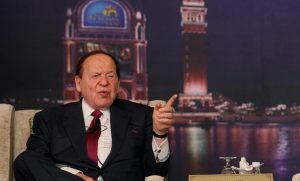 Marcus and Adelson, who are also board members of the Likudist Republican Jewish Coalition, have already received substantial returns on their investment: total alignment by the U.S. behind Israel, next week’s move of the U.S. embassy in Israel to Jerusalem, and the official dropping of ‘occupied territories’ to describe the West Bank and East Jerusalem. “Adelson, for his part, was Trump and the GOP’s biggest campaign supporter. He and his wife Miriam contributed $35 million in outside spending to elect Trump, $20 million to the Congressional Leadership Fund (a super PAC exclusively dedicated to securing a GOP majority in the House of Representatives), and $35 million to the Senate Leadership Fund (the Senate counterpart) in the 2016 election cycle.